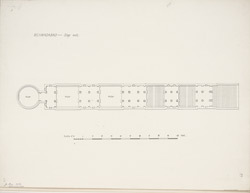 Plan of a step well at Mehmudabad from James Burgess' 'Original Drawings [of] Muhammadan Architecture in Gujarat.' The step-well, located at Mehmudabad in Gujarat, was constructed in the fifteenth century in the period of Sultan Mahmud Begada (r.1459-1511). A larger, more well know step-well at Mehmudabad is the Bhamaria Well.